The pipe you're working with (or selling) is coated with Dual Layer FBE. Dual Layer FBE is very often used on pipe that will be involved in a road bore or a directional drill. The pipe you're working with or selling is coated with Powercrete or an ARO (abrasion resistant overcoat). This will almost always mean that the pipe is going to be part of a road bore or directional drill. You heard mention of "road bore", "directional drill", "directional crossing", "beach pull", "river crossing", "thrust bore" or "push bore". You hear mention of "epoxy sleeves", "wear cone", "leader strip", "leading strip", "fiberglass sleeves" or "thrust bore kits". 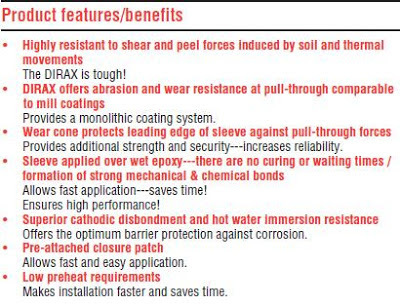 You have an application where you know the pipeline coating will be required to withstand extreme forces, extreme soil stresses or significant abrasion and/or penetration forces.